As a professional photographer you certainly know that taking pictures is only half of the hard work. The other half is portrait retouching and it takes a lot of time and effort. SoftOrbits is happy to introduce a totally new portrait retoucher that will make this process much easier and faster! SoftSkin Photo Makeup is a professional tool for those who want to always have ideal photographs. It allows to improve skin texture, even skin tone, apply virtual makeup, remove red eye effect, whiten teeth and eyeballs and much more. First, upload the image or images to the program using the "Add file(s)" button. Then zoom in the picture for more accuracy. Select the concealer tool to apply powder, eye shadow or toner. You can choose the desired radius and pick the color on a pallet. 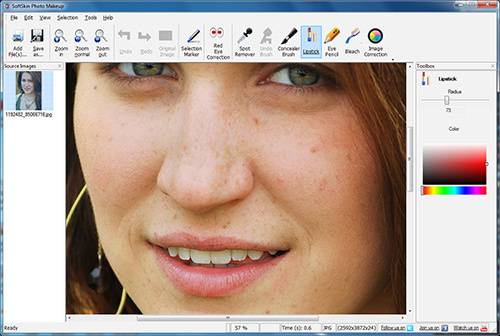 Then select the eye pencil tool and draw over the eyes to make them stand out. To add more color to the lips, select the lipstick tool and choose the desired color on a pallet. 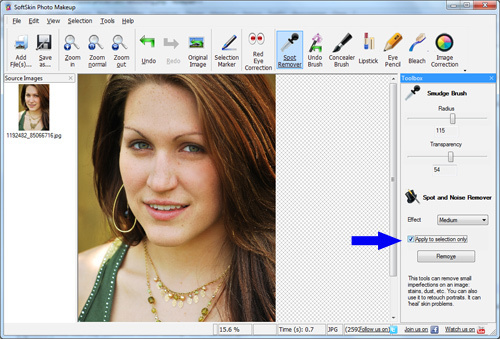 When done, click the �Save as� button to save the retouched image in BMP, GIF, JPG, PNG or other format. Download SoftSkin Photo Makeup to retouch portrait now! To apply virtual makeup, consider using the Lipstick, eye pencil and concealer tools.